Republican presidential nominee Mitt Romney pauses while speaking at a campaign rally at the Patriot Center at George Mason University in Fairfax, Va., on Monday. Over the pre-election weekend, we began hearing people, mostly Republicans, say that if Mitt Romney does not win the presidency this week it will be because of superstorm Sandy. That could be savvy analysis, or it could be the first signs of a search for an excuse. Either way, it's premature. 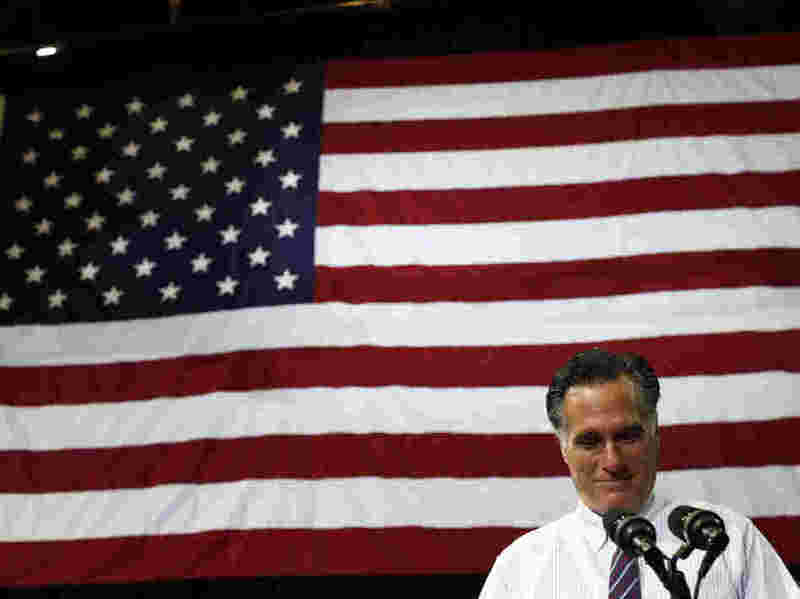 For the moment, the Romney campaign should be looking for a way to turn the storm to its benefit. The first thing to be learned from Sandy is trajectory. Sandy began its destructive tour of the American mainland in Florida, and that is where the former governor of Massachusetts needs to begin his march on Election Night. If Romney wins Florida, he instantly leaps into real contention by adding that state's 29 electoral votes to the 191 that virtually everyone agrees he already has locked up (counting all the states the GOP ticket won in 2008 plus Indiana). Florida lifts the nominee to a projected 220, with just 50 to go to the White House. Following the Sandy track sends him northward to two more battleground states that felt Sandy's wrath just a week ago, North Carolina and Virginia. Most map- and chart-makers (including us here at NPR) have already awarded North Carolina to Romney and his running mate, Paul Ryan. If close-fought Virginia follows suit, the R-R team suddenly has 248 electoral votes and a gale-force wind at their back. One more coastal state that took a hit from Sandy still looks winnable for the GOP, and that is the once-safely conservative enclave of New Hampshire. This is the site of a longtime Romney vacation home and the place where his campaign for the nomination really got going. He ended his final full day of campaigning there Monday night. But even with Florida, North Carolina, Virginia and New Hampshire in hand, Hurricane Mitt would still be stuck at 252 votes. At this point, let us remember that hurricanes are notoriously unpredictable. Hurricane Mitt needs to be ready to move in unexpected directions. One possibility for a breakout would be Pennsylvania, which received a glancing blow at its eastern extremes from Sandy. The state has 20 electoral votes, enough to pass the magic 270. It has not been seen as a toss-up since summer, but narrowing polls there in recent weeks have given Republicans hope. The Romney campaign is running TV ads there, and the candidate himself added an event in the state on the final weekend and a closing rally in Pittsburgh on Election Day itself. If the late assault fails to rip Pennsylvania loose from the Obama camp, then the next target over on the Great Lakes is Ohio. This is a state where the race has always been close and where the Romney campaign has spent heavily in time and TV advertising cash. Republican superPACs and other independent-expenditure entities have also targeted the state and pounded the president (and Democratic Sen. Sherrod Brown). While both those incumbents remain ahead in the polls, their margins are slim at best. Parts of Ohio did feel the storm last week as it moved inland. Parts of the state are also susceptible to Republican messaging late in a presidential campaign. And to capture the state's 18 electoral votes would bring the "Follow Sandy" strategy's yield to exactly 270. Here's one more way the storm could help Romney. Hundreds of thousands of voters will find it more difficult to turn out in the New York and New Jersey metro areas. Although state and local officials have done what they could to provide alternatives and looser rules, many of these voters will be too busy and distracted to take part. That could lower the vote in New Jersey, New York, Connecticut and parts of New England as well. A suppressed vote in these Democratic areas heightens the chance that Romney could come out ahead in the national popular vote â" even if he doesn't in the Electoral College. The split between the national popular vote and the Electoral College was already a prospect before Sandy came along to make it more plausible. But in an election contest this grinding, with even small swing states getting multiple candidate visits, any change in the weather can seem dramatic. And a divergence between the popular and electoral tallies would prolong the ordeal of this election season indefinitely, and make it more difficult for the president to lead in his second term.